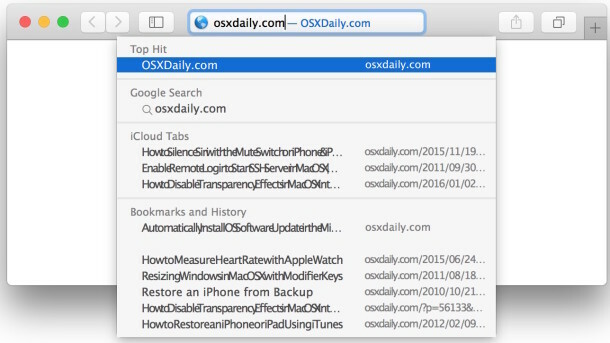 Some users have noticed that Safari hangs unexpectedly when attempting to type a search or URL into the address bar. This is usually a temporary disruption, and after a moment or few the text entry begins again within the Safari address bar as the address bar populates with smart search data and search results from the default search engine in the browser. Safari freezing up when typing a URL or search into the address bar is pretty annoying however, but fortunately with a few adjustments you can usually resolve this issue rather quickly in OS X or iOS. Before anything else, be sure you have updated Safari to the latest version available, you can check if there is a Safari specific update waiting by going to the  Apple menu > App Store > and reviewing the Updates tab for Safari software updates. The latest versions of Safari tend to perform better than prior releases and include bug fixes. Quit out of Safari when finished and relaunch the browser, type in the URL bar again either a website address or a search as you typically would, no more freezing! This should completely resolve the hanging search bar activity in Safari on the Mac, and typing and entering searches or website addresses should now be as fast as expected. Quit and relaunch Safari and then try using the address bar / search bar again, it should no longer hang on iPhone, iPad, or iPod touch. Sometimes however, this is not enough, and also sometimes users notice that Safari will freeze up when typing in the search bar on the Mac as well as their accompanying iOS devices. If this happens on multiple devices, the steps above may not be sufficient to remedy the problem, as it may actually relate to iCloud syncing of Safari data. If this is the case, you can force the Safari iCloud data to sync from a Mac to iCloud which often resolves the problem, but for users on particularly slow internet connections, sometimes simply disabling Safari usage of iCloud on the Mac is the only solution, which is possible in System Preferences > iCloud, and unchecking the “Safari” option found within the preference panel, doing this will disable both iCloud Safari tabs and Safari bookmark syncing through iCloud however. Let us know in the comments if this has worked to resolve the freezing Safari address bar issue for you, or if you have another solution be sure to let us know of that as well! This is not a fix, its a work around. Suggesting people turn useful features off as a fix, is like saying, “I’ve got a fix for safari’s slowness, take out the batteries and unplug from the wall, never turn on again”. Ian, it fixed it for me, but by all means, if you know of another solution you should detail it thoroughly as this walkthrough does. Until you or Apple come up with another solution, this is the only solution to this problem. This is crud anyway. Sometimes “features” are buggy, disabling those “features” is the only solution to the bug. This is iOS and OS X in a nutshell in the post Jobs era, software quality is on par with Microsoft in the 90’s. If you find a bug to be useful, that’s wonderful, enjoy your bugs. You will love every update then. It amazes me that in 2018 we still have this same problem. How many updates of the MacOS and Safari have been and gone? How can this still be a problem? My fix is to.use chrome. I don’t have the problem on My 2015 Retina MacBook Pro with 16GB RAM but it happens on my iMac with 8GB RAM. My solution is also to use Chrome. 2010 MacPro 48GBs and 96GBs RAM booted off PCIe SM951s and hardwired to network. No problems here. Oh, still using Mavericks and the last Safari from era but with Security Updates. iOS 9.2 on iPhone 6+. Safari works great. Wouldn’t switch to data mining Chrome if it was the last browser on Earth. Would use Lynx instead. Apple has been pulling a “1995-96” on us lately but Safari is still great. Firefox can be set up well too. Be sure to use Ghostery. Try Little Snitch and you’ll be applled by Chrome. Constant and multiple sources phone home. Thanks for this. This happened to come up on my MBP just yesterday and I thought it might be iTunes causing but this seems to be working. Good until Apple sorts it. Nice workaround. It works on my MPB 13″ from 2012.. but my imac 27″ late 2009 is still hanging. At least on my computer I didn’t need to turn off all of the Safari features – it was just the “Include Safari Suggestions” box that needed to be unticked. Worked like a charm. I did the preferences and removing the smart search and restarted safari. Awesome! Thanks so much. THANK YOU! This was driving me insane last night! It’s the first time this has happened to me, randomly too, had not done any updates that day or added anything odd. Updated to latest Safari, that didn’t fix – so then became the trawling through Google Chrome. Don’t care if it’s just a workaround rather than a fix, but it worked! Hello Apple/Safari whomever… sort it out!! !